Paeonia Red Sarah Bernhardt isn’t, contrary to what its name would imply, a red version of Sarah Bernhardt. In fact, this variety from China has no similarities to Sarah Bernhardt at all. It’s not even red, but purple and cerise coloured. It has large flowers that bloom beautifully, when cut at the right stage of maturity, which is an unique attribute for a peony of this colour. This peony is a full-petalled lactiflora with a beautiful purple colour and fragrant flowers. The stems and leaves are strong and darkly coloured. Red Sarah Bernhardt was registered in China in 1980. Unfortunately, it is unknown who has bred this particular variety. 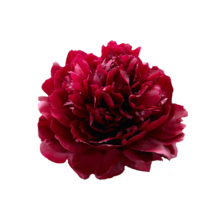 Another variety of peony, Fiona, shares strong similarities with Red Sarah Bernhardt and is sometimes sold under that name. The buds of this peony variety open up easier than Kansas, its main competitor. Make sure that the bud is soft and the bracts aren’t closed too tight for the best results. Cut the stems diagonally and put Red Sarah Bernhardt in a vase filled with lukewarm water. This beautiful peony has a vase life of about ten days.